There were hundreds of different makes and models of American cars in the twenties. Among them was the Earl of Jackson, Michigan, built from 1921-1923. Named for the company's president and founder Clarence A. Earl, in its earliest days it was advertised as a car with appeal to "your love of the beautiful and your common sense." Essentially a longer, more powerful Briscoe, the 40 series Earl cars were sold as a rare combination of down-to-earth mechanics and styling beauty. There were open and closed models, all built on a 112-inch wheelbase with 4-cylinder engines. Since so few were ever built, to find one today is definitely a rarity. 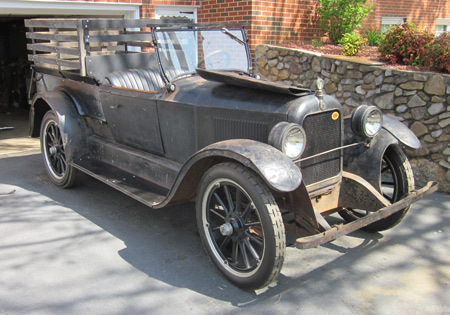 Unrestored 1922 Earl Screen Delivery Car — still alive and kicking. Clarence A. Earl, a descendant of an old English family, traced his American roots to Edward Earle of York, England who came to America in 1676, settling in New Jersey. Clarence's parents were William Alexander Crane Earle (born 1838), and Phebe Ogden Magie, who married into the family in 1866. On November 23, 1874, in Elizabeth, New Jersey, Clarence was born. After an education at public schools, he became an office boy for American Hardware Co. in New Britain, Connecticut. That company, still in business, made keys, post office boxes, locks, etc. In the early 1900s a subsidiary company was established to manufacture the Corbin car. Whether or not Clarence had any involvement with the subsidiary, we know that he eventually worked his way up to the position of vice president in the parent company. Resigning from that company, he next became the vice president and general manager of Hendee Manufacturing Co, in Springfield, Massachusetts. Hendee made bicycles, known from 1898 onwards as the "Indian", later the name also given to the motorcycle the company produced. Earl remained with the company until October, 1915. By then he had met Mabel Harrop, whom he married on May 21, 1900, in Findlay, Ohio. The next step in his career journey took him to Willys-Overland Co. of Toledo, Ohio in late 1915, where he served as vice president. A year after his arrival there his new home was ready for occupancy. It was a large brick house with white-columned entrance at 4215 River Road. The house had an attached garage, still an unusual feature at that time, and careful landscaping. A son, Clarence A. Earl, Jr., must have enjoyed growing up there. The father's new Ohio roots also enabled him to become a member of the Toledo Club and the Country Club of Toledo. Willys-Overland was going toe-to-toe against Ford. In 1915, its production numbers were second only to Ford, and in 1916 its production volume, at 143,000 vehicles, was also rivaling Ford's. By 1917, Willys-Overland was selling its car (which had a self-starter and electric lights) for less than $500, a price close to Ford. One of the largest employers in Toledo, it had a work force of about 15,000, and it had built a strong distributorship network. In 1919, as World War I ended, however, car manufacturers were feeling the effects of wartime inflation and the cost of Willys-Overland cars had risen to $845, a price significantly higher than Ford charged for his Model T. While Ford's volume enabled him to pay his workers $5 a day, other manufacturers were unable to match the wages he paid. John Willys, founder and president of Willys-Overland, was, by all accounts, a workaholic. He enjoyed a solid working relationship with his staff, in part because he worked so closely with them, putting in 14-16 hour days, seven days a week. As his company grew and diversified into other areas, however, he felt the need to move to New York City to manage his holding company which included, among others, a tractor company and an aviation company. He left Clarence Earl in charge of Willys-Overland, but Earl lacked significant experience in heading a production team. He knew, though, that production needed to be increased and he had an idea of how to accomplish that. In 1918, Willys-Overland had offered a substantial increase in wages and profit sharing but a year later the company was flagging. Without discussing matters with its workforce, it increased the length of the work day and the work week — at no additional compensation. Workers were expected to work 48 hours: five days of 8 hours 36 minutes and one day of 5 hours. The company did not offer any increase in wages and an affiliated branch of the machinists' union believed the work week should not be longer than 45 hours. In mid-April 1919, employees divided $400,000 in the first distribution on a 50-50 profit sharing plan adopted in January 1918. Profit sharing was limited to those who'd worked with the company at least six months and the first tranche paid was equivalent to 8% of the wages paid during the first quarter. Plans called for a total of five distributions throughout the year with another small bonus for length of service. The company already offered its employees a training school and affordable housing. Just a few weeks later, however, employees let management know the cost-sharing scheme was insufficient. On May 5, 1919, 7500 employees (2/3 of all employees) left a half-hour early. The next day the company locked them out, and a strike was declared, the auto industry's first major strike. Besides the shorter work week, workers also demanded a minimum wage of 40 cents an hour (an increase of 10-25 cents over what they were being paid) and equal pay for women. While the company agreed to the minimum for men over 21, all others would be paid only 30 cents an hour. As labor unrest grew, the company, lacking a security force, closed its doors. Some workers commuting by streetcar were made to get off — unless they could show a Chevrolet work badge. Willys-Overland hired strike breakers and housed them on company grounds. Toledo's mayor Cornell Schreiber began meeting with management and labor to resolve the wage issues but despite four full days of negotiations, on May 14, negotiations broke down. Even as negotiations had been ongoing, though, Willys-Overland had fired a union official. They also began hiring women to replace striking men. The company reopened on May 26 for a brief time, again closing its doors on June 3 when it could not maintain order. On May 30, the mayor hired 200 "emergency policemen" to help local police in their efforts. By and large, these were recently discharged WWI soldiers untrained as civilian peacekeepers. In time, the number of emergency policemen would increase to 700. The mayor also tried to enlist Governor James M. Cox to send out the National Guard but the Governor was unconvinced of the need. As strikers advanced towards the plant on several occasions, mounted policemen rode towards them, pushing them back. Company guards fixed bayonets to prevent strikers from getting closer. Most strikers, in the face of such opposition, gave up and retreated from the plant building. As the strike continued, however, tempers flared, with local businesses taking out newspaper ads decrying the strike and likening strikers to Bolshevik revolutionaries. There followed a number of rock-throwing incidents, arrests, and beatings. On one occasion, a mob marched to the police station, intent on obtaining the release of two union members arrested earlier that day. They were unsuccessful. However, on the night of June 3, in Lagrinka, a Polish neighborhood in South Toledo, a group of several thousand strikers and supporters cornered one of the "emergency policemen" out for a night with his girl, forcing them inside a fire station. An alarm went out and six carloads of policemen arrived on the scene, ordering the crowd back from the building. Other "emergency policemen" arrived on the scene. A riot ensued, with crowd members throwing stones and bricks and policemen firing teargas and bullets into the crowd. At least eleven were wounded and two were killed. Earl ordered the plant closed, saying he would not open it until it was safe to do so. Judge John M. Killitts of U. S. District Court for the Northern District of Ohio issued a temporary injunction against the strikers. With that injunction, Judge Killits's involvement in the strike deepened. He controlled the guards and "emergency policemen" hired to keep order. Insisting on regular reports and strict discipline, he established order. He demanded peaceful picketing and set restrictions on the number of pickets and the number of plant exits in use. Initially he restricted the number of picketers to 200 but after some unruly behavior, further limited their number to 50. As the number of picketers was reduced, the judge also reduced the number of policemen on site. On June 7, the judge ordered that only U.S. citizens could picket. On June 10, 25 Secret Service agents were sent to Toledo to enforce the judge's order. The following day another 25 arrived, the judge increasing the number as needed to restore order. They were not only to function as guards but also were authorized to attend worker meetings and report to the court. They knew the information they gleaned could be used, as well, to deport undesirable non-citizens. The basis for a permanent injunction against the workers came after Dail-Overland Co. of Greensboro, North Carolina sued Willys-Overland, the Auto Trades Council, the Machinists Union, and others, claiming it had an agreement with Willys-Overland for delivery of a certain number of cars. The strike prevented delivery. Dail-Overland had sold out of its May allotment, was quickly running out of parts and supplies, and received no deliveries in June. Thus, their business was adversely affected. Citing the Clayton Act, a 1914 amendment to the Sherman Antitrust Act which prohibited a number of actions impeding free market competition, Judge Killitts sided with business and demanded that workers return to work and that they cease any interference with company operations. The Willys News, the Willys-Overland employee newsletter, of June 20, 1919, directed striking employees to return to work or lose their jobs to others. Earl said, "Our wages are equal to, or higher, than wages of any competing automobile plant. They involve raises for more than 12,200 jobs and reductions for none. It is reasonable to conclude that for some reason unknown to us, some of our employees may prefer to work elsewhere, regardless of rates. These employees must understand that they have a perfect right to follow their desire in this matter. In fairness to themselves, however, they should make this decision now and act accordingly." Willys-Overland continued its insistence on a 48-hour week, noting that in nearby factories union men were working 50-55 hour weeks. The company also agreed to equal pay for women — so long as they were performing work ordinarily done by men. By mid-July the company had resumed normal operations. But in August, facing a continuing downward financial spiral, Earl laid off 2500 employees, describing them as "surplus" labor. Instead of the 180,000 cars they'd planned to produce in 1919, Willys-Overland built only 94,000 cars that year. Prices were lowered and sales volume increased but it was not enough to stave off an enormous financial setback. A national, post-war depression in 1920 only made matters worse. People were struggling, and they weren't buying many cars. Willys owed about 130 banks more than a hundred million dollars. New York banker creditors, led by Chase Manhattan, were extremely nervous about getting their money back so they hired Walter P. Chrysler, recently retired from Buick, as their agent to manage Willys-Overland. He negotiated a two-year contract with them, at a salary of $1 million per year — and no promises as to what he could accomplish. As soon as he was on board in January 1920 as executive vice president and general manager, he halved John Willys's salary (from $150,000 to $75,000) and fired Clarence Earl. Whether Earl was a poor manager or just ill-equipped to handle a major strike, he had been viewed as incompetent. In Chrysler's time with Willys-Overland he managed to reduce debt from $48 million to $18 million. He did so by eliminating excess production capacity, selling unneeded equipment, cutting the office work force, canceling commitments to parts suppliers, etc. Working with the trio of Zeler-Skelton-Breer Engineering, he also developed and sold a new car model, the Chrysler Six. Chrysler Motor Co. had been established as a separate division of Willys. After failing in an attempt to wrest the company from Willys, however, Chrysler left for Maxwell. Maxwell was another auto manufacturer he had begun working to save just six months after starting with Willys-Overland — after he had secured John Willys's blessing to do so. After the firing from Willys-Overland, Earl landed on his feet, being elected president of the Briscoe Motor Corporation on March 29, 1921. Briscoe traced its start to the late 1880's when its founder Benjamin Briscoe owned a company that produced sheet metal products, among them radiators and fenders for the new car industry. About 1903, Briscoe was doing well enough to lend $3500 to struggling car maker David Buick, in exchange for a 97% interest in the business. That same year Jonathan D. Maxwell, who understood mechanical engineering, convinced Briscoe to leave Buick and team up with him instead. Over the next five years the Maxwell-Briscoe Company produced two-cylinder runabouts and larger 4-cylinder cars. The company did well, by 1909 becoming America's third strongest-selling marque. Following the San Francisco earthquake of 1906, the country was in for a recession, resulting in a six-week run on banks in October and November, 1907. Reacting to the unsettling state of affairs, Briscoe suggested a consolidation of Ford, Buick, Oldsmobile, and Maxwell-Briscoe. In the days prior to antitrust legislation, this was not such an outlandish idea. While Briscoe got an investment of about $6 million from banks, that was an insufficient amount. When negotiations with Ford and others proved unsuccessful, Briscoe was left to finance the venture himself. The United States Motor Co., formed in 1910, was to be financed, in part, through debentures sold to automotive retailers who were given a guarantee of favorable financing for their sales inventory. The makers eventually agreeing to the conglomerate included Maxwell-Briscoe, Brush, Stoddard-Dayton, Courier, Columbia, and Alden-Sampson. Once financing was in place, Briscoe went on a buying spree, purchasing 126 companies and constructing a multi-story Manhattan office building for his headquarters. The company grew and expanded rapidly — too quickly, in fact. Briscoe was forced out of the company and U. S. Motors went into receivership in 1912. Soon thereafter Briscoe and his brother Frank sailed to France, where they produced a cyclecar they planned to sell in the U.S. That enterprise was short-lived, though, and the brothers returned to the U.S. Financiers who had backed the idea of the United States Motor Co. had soured on any further financing but the Swift meatpacking company came through with the needed capital to buy out the Brockville auto manufacturer in Jackson, Michigan, where Briscoe began building his Briscoe car. In January 1914, it debuted at the New York Auto Show. Similar to the French-built cyclecar, it was promoted as the first French-designed American car, one with a "half-million dollar motor", the amount spent on its development. Early versions of the car had a single headlight and body panels made of papier mache placed over wood framing. 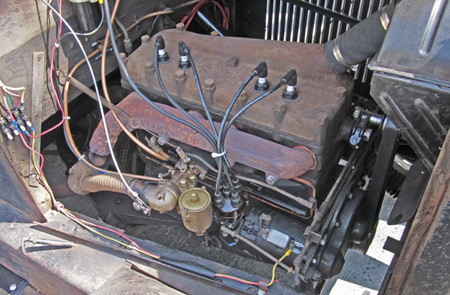 Later Briscoe brought out an air-cooled, 24 hp four-cylinder car. Following WWI, he offered to sell plans for building a 4-cylinder car; any U.S. town could get into the car business. In 1920, his chief engineer Jules Haltenberger devised a plan to simplify production greatly by using a single design for many components. He used, for example, a reversible propeller shaft, identical castings for clutch and brake pedals, a single design for spring shackles and bolts, etc. It may have seemed a good idea at the time but it led to numerous component failures. Sales, which had been strong, weakened considerably. On July 1, 1921, prices were reduced $200. Ads listing Clarence A. Earl as president read, "Before you decide, take a Briscoe ride." — and "Briscoe at $1085 is a better car than it has ever been in its history." One ad of the day praised the leadership Clarence Earl exerted on the company: "Every motor car built is based on man-power as well as horsepower. Every manufacturing and selling organization is the lengthened shadow of a man. In the case of Briscoe, this man is Clarence A. Earl. Clarence A. Earl is the new president of the Briscoe Motor Corporation. For years he has been admittedly one of the leaders among the makers of motor cars. Among automobile men his name is a guarantee of value and quality, of fair dealing and progressive methods. When automobile makers generally joined in the recent price-cutting scrabble with one eye on their competitors, Earl stood apart. He knew just how far lower material costs would allow him to reduce Briscoe's price without shaving quality. He reduced Briscoe from $1285 to $1085 and not one penny further. His previous experience had taught him that an automobile of real quality cannot be produced below a certain figure." When lowered prices failed to build sales back to previous levels, Benjamin Briscoe, saying he was tired of it all, turned over the car and the company to Clarence Earl in October, 1921. While Earl continued to produce and market the Briscoe, it didn't take him long to correct some of the Briscoe's deficiencies and introduce his own car, the Earl, one advertised as "better looking and better built" [than the Briscoe]. In assuming responsibility for the Briscoe, though, Earl took on $1.5 million in debt. He needed to market the remaining Briscoes, and he needed to convince financiers quickly to invest in his dream of the new Earl. On October 3, 1921, the press announced the formation of Earl Motors, Inc., with additional capitalization of $6 million. Earl, now 47, had met with bankers in September to get things started. Thereafter, the board of directors, largely comprised of bankers and representatives from suppliers such as Ajax Rubber, Hayes Wheel, and Sinclair Refining, voted unanimously to back the new company, one which still owned nine plant buildings. George C. Scobie, who had worked both with Price-Waterhouse and Hayes Wheel Co., was named vice president and controller. Earl released information that he had plant capacity to build 15,000 cars a year and a further plan to double capacity the following year. The Earl was even international in that it had a production facility in Brockville, Ontario. Clarence Earl had already expanded lines of distribution, adding twenty new distributors and 240 dealers since he'd taken office. The Earl was to be a new four-cylinder car in both open and closed models, the enclosed ones ready for delivery October 15 and the open ones ready on November 1, 1921. The 40 Series cars were longer (112" vs. 109" wheelbase) and more powerful (37.5 vs. 35 hp) than the Briscoe. And a number of the Briscoe's mechanical flaws had been worked out. There were basic models: brougham, sedan, cabriole, roadster, and touring car, but the car was also available with screen delivery (screened sides and back) and panel delivery bodies. 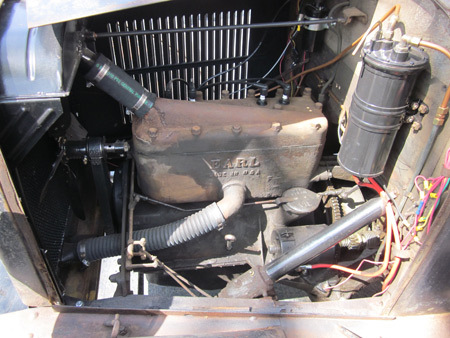 The cars utilized worm and gear or worm and wheel steering, had semi-elliptical leaf springs and an 18-gallon gas tank, and offered motorists three gears. The L-head motor with a piston displacement of 195 inches engines, stamped "EARL, Made in USA", was small bore and long stroke. The crankshaft was three bearing and well-balanced. 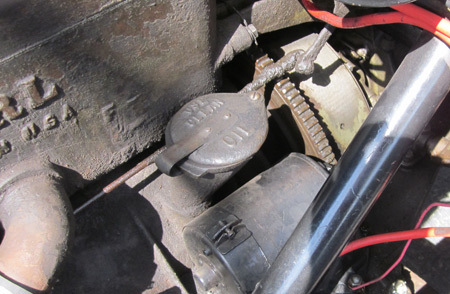 A U.S. L. battery provided ignition and the starter and generator were produced by Auto-Lite. There were 14-inch brakes. The cars had wooden wheel spokes and non-skid, 32x4", cord white-walled tires. 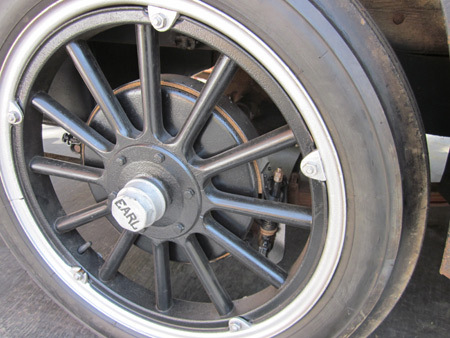 "EARL" was stamped onto the wheel hubs. The weight of each car was in the range of 2250-2780 pounds. Customarily there were few color choices — black, blue or gray exteriors with nickel or platinum trim, and black or gray interiors — but more colors were available for some models. Earl Engine showing brass carburetor. Earl Engine oil filler cap. Notice open flywheel. External band-type brakes on rear wheels only. As the new car on the scene, the Earl tried to woo buyers with its many "extras", at no extra cost. Earl claimed that allowed customers at least a $100 savings over other marques. There were linoleum floor boards and carpets front and rear. The drum-type headlamps had non-glare lenses, and there were side parking lights, as well. The steering wheel consisted of four metal spokes and a wooden rim. There was walnut trim on the instrument board, which featured a speedometer and odometer. The Sparton horn, manufactured by the Sparks-Withington Co. of Jackson, Michigan, blared that familiar ah-oogah sound. A Perfection heater was good for cooler weather. The hood was side-opening. 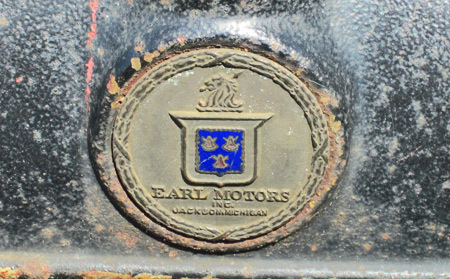 An Earl Motors crest adorned the front of the car, the crest of the Earl family. One version was a white circle with green rim an "Earl" written in orange letters in the center. Another was a white wreath with silver accents encircling the coat of arms which had a blue inner field featuring three elongated scallop shells. The blue was surrounded by a larger red area, and a profile view of a knight's helmet (or, on some models, a lion's head) topped the family coat of arms. A Boyce motometer sat above the emblem at the nose of the car, covering the radiator. There was a divided front windshield with a sun visor, and a single windshield wiper on the driver's side. Side windows were crank-operated. The car, with dome light and rear-view mirror, also offered a robe rail and mats for the running boards, and was accompanied by a full set of tools. 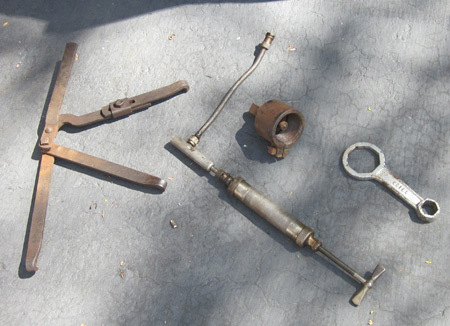 Tools that came as standard equipment on Earls include tire removing tool, axle hub remover, wrench and grease gun. 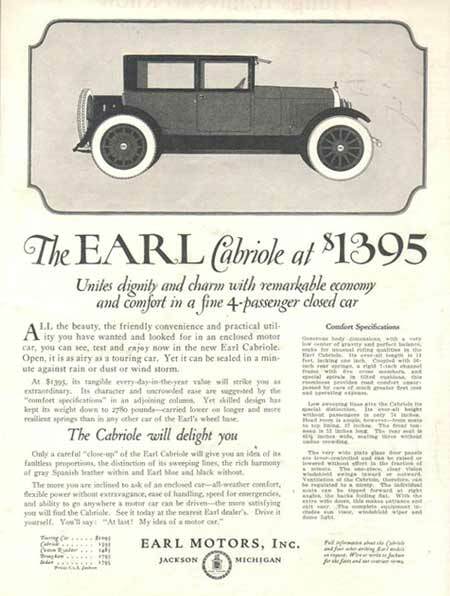 An October, 1921 ad gave the Earl this tag line: "Where Values Rule Earl Is First." 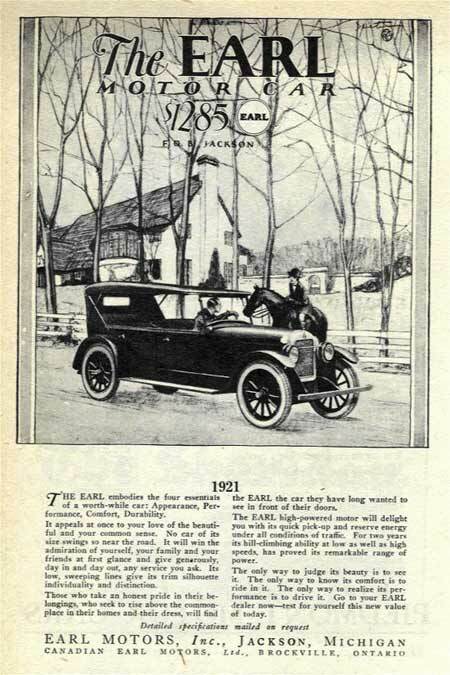 Another ad in the Pittsburgh Press of December 11, 1921, featured the Earl Motorcar at $1285 and extolled it as a sensation at the recent London Automobile show where it had been exhibited for the first time ever. The copy writer explained that the car had "aroused greater interest, more discussion, and more appreciative comment than any other American car in the London Show." In the U.S., the copy continued, it repeated its favorable impression as "a car of such distinction, a car so individual, that we believe it will win your instant admiration the moment you set eyes on it." Said to have been developed in the Allegheny Mountains, it claimed quick pick-up and an "almost complete absence of gear shifting." And "motor-wise London marveled when the selling price was named." Despite the popular buzz, Earl continued to experience challenges in production and sales. It didn't help, either, that in the summer of 1922, whether prompted by an unruly competitor, a disgruntled employee, or even a jokester friend, there was trouble afoot. Beverly Rae Kimes, in her expansive catalogue of pre-war cars, explained that a bewhiskered Mr. Branigan, a hoaxster posing as a representative of Earl Motors, began to make numerous orders. Once he ordered and had delivered to Earl headquarters 100,000 menu cards for a non-existent company banquet. Another time he sent expensive new awnings. It was just the sort of headache a new company didn't need. Roadster. An open, two-seater roadster was deemed, in a 1921 ad, "conservative enough for the gentleman who doesn't like crowds" and "snap enough for the youngster who still has a full life to live." Continuing, the ad explained the car had "flexible power, instant pick-up, speed to spare and the low, sweeping lines which custom builders could not better." The car, which sold for $1395, was available in horizon blue with blue and black striping; mustard with blue striping; or gray with blue striping — and black wire wheels. Rather than a running board, it had a step, and it featured a sloping rear deck. Touring Car. A 1921 ad for the 5-passenger convertible touring car depicted a well-dressed young man seated on a leather seat and leaning slightly out the window to speak with a young woman in riding habit perched atop her horse. In the background was a manor house surrounded by a fenced-in estate. The claim was that the car, available for $1285, embodied the four essentials of a worthwhile car: "appearance, performance, comfort, [and] durability." Its promises were many: "It will win the admiration of yourself, your family and your friends at first glance and give generously, day in and day out, any service you ask"; "Its low, sweeping lines give its trim silhouette individuality and distinction"; and "The EARL high-powered motor will delight you with its quick pick-up and reserve energy under all conditions of traffic." Advertisers of the day may have been just as prone to exaggeration as ones working today, though. While the ad claimed the Earl had proven its hill-climbing abilities for two years, the Earl was actually still enjoying its first year of production. A year later the Earl Touring Car, available at $1095, was advertised as setting a new standard of motor car values. Besides design and engineering achievements, "All the savings made possible through cash purchases in low material markets and large-scale production by experienced factory workers have helped to hold down the price and create its unapproachable values." It boasted "a new steering gear, rigid 7-inch channel frame, rugged front and rear axles, quiet transmission, 56-inch rear springs, Alemite lubrication and a special Borg & Beck disc clutch." Brougham. The two-door Brougham (aka Town Car) body was built by J. C. Widman Co. and was built to provide "intimacy and riding ease in an exquisitely finished four-passenger enclosed car. Selling at $1995, one 1921 ad called attention to its "fascinating low lines and graceful proportions, heavy gray brocade upholstery, dull platinum fittings, and tilting front seats." It was the car Earl featured at the 1922 New York Automobile Show, a show where twelve new cars enjoyed their national debut. In an advertisement appearing on January 19, 1922, the copy targeted the country-club set and suggested the Brougham was perfect for golfers. It explained, "The country club is a great factor in our modern life and it has a direct bearing on the character as well as the number of motor cars. There are in round numbers more than two million country club or golf club members. As these clubs must of necessity be in the country where space for indulging in golf is obtainable, the usual method of reaching the club is by automobile. For such occasions closed cars or semi-closed cars such as the Earl touring sedan and the Earl sedan offers [sic] comfort and convenience; but it is the Earl brougham, quite a new type of brougham, by the way, that has a distinctive advantage. The Earl brougham offers a special social service by its unique arrangement of a trunk which is an integral part of the design, lending beauty and symmetry to a car or unusual charm. The trunk is specially placed on the rear. [Note: the trunk rested on a platform protected by maple slats in a natural finish.] It is of beautiful long-grain French finish Duratex covering and bright with nickel studding. Inside of the trunk is a grain leather hat box which a woman can not [sic] help but appreciate. Also there are two good sized suit cases. The suitcase makes it possible to carry an extra suit, dress, in each suitcase and such other apparel or individual toilet requisites as are needed. This arrangement is pronounced admirable by all socially inclined who have seen it. However, these little niceties are equally of value to the tourist, either on long or short trips. The trunk is dust proof, affording all weather protection." Before the days of built-in trunks, it was definitely handy to be able to pack your gear outside of the passenger compartment. And the rear-mounted spare tire gave extra protection against a flat tire during a sporting journey. An ad in the Pittsburgh Press, dated Christmas Eve, 1922, listed the Earl Sedan and the Earl Brougham at $1595 each and added this appeal to customers: "Come in and see these remarkable closed cars today. Ride in them. Drive them. Or telephone and a demonstrator will meet you at your own door." Interestingly, in that same newspaper edition, a Ford touring car was selling at $298, and Chevrolet cars were priced from the low-end roadster at $510, to the high-end sedan at $860. Due largely to their production numbers, the major makers could keep their prices low and makers like Earl could not compete on price. Sedan. The Earl Sedan, selling at $1995 in 1921, was seen as "a luxurious, closed car, swung low on 56-inch rear springs, with Marshall spirals [springs] beneath the deep-pile cushions pitched at the angle insuring the greatest riding ease." Continuing in this vein, the ad also praised its "clear vision in all directions" and "ample head and leg room." A 1922 ad included a testimonial from a Chicago man involved in real estate who claimed the car had gone 4300 miles on 189 gallons during its first four-month period. On May 4, 1923, the Fredericksburg, Virginia newspaper The Free Lance-Star announced that an Earl Sedan was first prize in a big subscription campaign. Painted a "delicate shade of blue" with black trimmings, it was touted as "one of the prettiest and most luxurious automobiles imaginable." Subscription sales competitors, who were told the sedan was on view in front of the paper's office, were assured, "For a man, this fine car will answer every need, and every woman would be proud to own and drive it." Touring Sedan. A five-passenger convertible car priced at $1595, the touring sedan was said to provide all-weather comfort, "plus the distinction only a closed car can give from October to May." Both the sedan and the brougham came with a wool broadcloth interior. The 1921 ad went on to detail that the car could be "completely enclosed for wintry or blustery spring days, [but] the glass front and door panels disappear, giving you a car as open and airy as a touring car for summer driving." Cabriole. Advertisements for the mid-priced, two-door, four-passenger convertible Cabriole are ubiquitous, appearing in publications such as Life, Vanity Fair, and The Saturday Evening Post. Their frequent appearances also lead to the conclusion that Earl must have spent the bulk of its advertising budget in trumpeting the Cabriole's virtues. In hopes of expanding its distribution, some of those advertisements were pitched to dealers. An announcement in Motor Record of October 1922 said the Cabriole was patterned after the brougham, with plate glass quarter windows that could be lowered and door windows that could be "manipulated instantly." The top and sides of the rear tonneau were covered with weatherproof black duratex fabric. One ad appearing in 1922 had an arched border at the top and a wavy border at the bottom, those borders enclosing circles surrounding the Earl family crest. Its claim was that the Cabriole, priced at $1395 ($400 less than the Earl sedan or brougham of the day), had won two great markets — businessmen favoring a "quietly distinctive, quality car" and women favoring "a closed car of style and comfort." Besides its smart lines and easily-operated mechanics, the car offered "velvet riding comfort." Like the brougham, it also provided trunk suitcases and hatbox as a $50 option. Another ad that same year heralded the union of dignity and charm and the resultant economy and comfort. Its convertible features made it two cars in one: "Open, it is as airy as a touring car. Yet it can be sealed in a minute against rain or dust or wind storm." Its interior was of Spanish gray leather and its "comfort specifications" appearing in a right-hand column included an over-all length of "14 feet, lacking one inch", 14-inch rear springs, a rigid 7-channel frame with five cross members, and special spirals in tilted cushions. With a height of 74 inches, it offered great head room at 27 inches from seat to top liner. The rear seat at 45-1/2 inches wide was said to seat three "without undue crowding." It may be fair to assume, however, that those three must have been very good friends. As for its convertibility, the company said its "very wide plate glass door panels are lever-controlled and can be raised or lowered without effort in the fraction of a minute. The one-piece, clear vision windshield swings inward or outward. Ventilation of the Cabriole, therefore, can be regulated to a nicety. The individual seats can be tipped forward at right angles, the backs holding flat. With the extra wide doors, this makes entrance and exit easy." An ad appearing in the August 3, 1922 edition of Motor Age, showed the Cabriole in profile and asked dealers to look at the new car "with a Buyer's eyes." There were, the ad continued, "many clever innovations in design." Among those cited were a left-hand ignition and dimmer switch that made night driving easier and safer, a long-stroke motor, and sturdy chassis. Dealers, impressed by the Cabriole's good looks and solid road performance, were told customers would swarm to their sales floors: "That $1395 price — with low upkeep and operating costs — puts the Earl Cabriole within reach of at least 100,000 Americans who have never yet been able to find the kind of enclosed car they fancied and they could afford to drive." "The right car, at the right price, with the right dealer discount," chirped a 1923 ad spotlighting the Cabriole. Dealers were told they'd find that physicians and business executives were pleased with the roomy, dependable car and that thousands of women had settled on the Cabriole as "the only right-price motor car which meets all their requirements." Panel Truck or Screened Delivery Car. These models were available from 1921, with the panel truck selling for $1160 and the screened delivery truck for $1085. Clarence Earl finally had control of his own car company and he pushed to increase production volume markedly. Unfortunately, his backers and supply executives watching the money dwindle were more cautious in their approach. After a number of increasingly heated disagreements, Earl resigned in November, 1922. The bankers and suppliers established George Scobie as president, by early 1923 establishing the new Earl Motor Manufacturing Corp. with a capitalization of $1 million. They continued to make Earls but in much smaller numbers. Although they reduced prices by $200 per car, it didn't take long for the company to fail. Only 2,000 Earls had been built. In the early part of 1924, servicing rights to the former company were sold to Standard Motor Parts Company of Detroit. Earl resigned in November 1922; later becoming president of National Automobile Company of Indianapolis. His bad luck persisted there, as well. In the early twenties, the company had moved to construction of only six-cylinder cars and had also devised the merger of eight companies, among them the Dixie Flyer and the Jackson. Just six months after Earl's arrival on the scene, a number of creditors sued National for non-payment of debt, and by January 1924, the company moved into receivership. Although Earl asked for a five-year grace period to get the company back on solid footing, his bankers were not inclined to oblige. Once more, Earl resigned. Despite the vagaries of the car business over the years, Clarence Earl persevered in his faith in the automotive industry. While few of his Earl cars were ever built, he must have been proud of his short-lived involvement with their production. He had seen a time when the ancestral Earl family crest appeared on every car rolling off his production line.